An unprecedented overspend by hospitals and other NHS trusts is expected to be announced later by health bosses. The figures for England from the regulator, NHS Improvement, cover the 2015-16 year, which finished in March. By December - the three-quarter mark - hospital, ambulance and mental health trusts were already £2.2bn in the red, with the figure expected to have risen. Overspending on agency staff has been highlighted as a major problem, as well as rising demand for services. Experts are warning the pressure the overspend puts hospitals under has an impact on care. Analysis: Is enough being spent by the NHS? The figures account for about two-thirds of the entire £116bn health budget - they do not cover GPs, training budgets, public health budgets held by councils or any unspent money held by local health managers. That means the Department of Health could still balance the books when the overall accounts are released later in the summer. But the expected overspend still has the potential to impact on services. This year the NHS is getting £3.8bn extra as part of the spending review settlement. 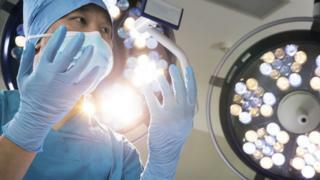 Some £1.8bn has already been set aside for hospitals to cover their deficits, but anything in excess of that will mean they will be under more pressure to make savings as the year goes on. A hospital trust financial director, who wishes to remain anonymous, suggested the Department of Health was "cooking up accounting alchemy" by "turning hospitals' very large aggregated deficits into a much lower figure to ensure the NHS meets the spending limit set by HM Treasury". He told the BBC that examples included shifting the recording of investment spending into day-to-day running costs. He said: "The so-called capital to revenue transfer may well be a legitimate accounting adjustment at the margins of the NHS accounts. "But I have grave concerns that it is being used on a scale of hundreds of millions of pounds in more than 80 trusts. The cash is being washed through hospitals' accounts as 'income' merely to improve the bottom line." A Department of Health spokesman said: "We are committed to the NHS and are investing £10bn in its own plan for the future, and it is vital that money is accounted for consistently. "The transfer from capital to revenue makes no difference to the overall departmental picture given Parliament has voted to approve it - to say otherwise is misleading." "We recognise parts of the NHS are under pressure as demand rises due to our ageing population, but we are providing intensive support to improve performance, boost efficiency and reduce the use of expensive agency staff." Chris Hopson, chief executive of NHS Providers, which represents NHS trusts, said concerns over accounting practices were a symptom of unprecedented demand on the NHS. He told BBC Radio 4's Today programme: "There's no doubt that the pressure this year is much greater than it has ever been, and that therefore each individual finance director and each individual board is having to make a decision about what they believe is appropriate." But he added that the practices were "a perfectly ordinary thing to do". David Bennett, a former chief executive of Monitor, the regulator of the NHS in England which is now part of NHS Improvement, said the Department of Health had to find a way of funding the deficit. "For certain, they will be scrambling around trying to find every little budget elsewhere that has underspent to try and make sure the numbers all add up". Does it matter if the NHS overspends? Hospitals and other health services are not like businesses. They're not going to just go bust, as the government can always step in. But the financial problems do matter. The deficits being racked up are massive. You probably have to go back to a very different era - the early 1950s - to find a similar scale of overspending, and that led to charges being brought in for spectacles, dentistry and prescriptions. This time the impact is likely to be felt in terms of what doesn't happen. The Department of Health has made it clear the overspends will not be simply written off. Instead, hospitals (most of the overspends are concentrated among them) will have to use the extra money they have got this year to pay off their debts. If that happens on a large scale, it puts the NHS on a back foot. Recruitment freezes are introduced, building projects are stopped or delayed and services are scaled back. These measures are already being taken, but more of them will just make it more difficult for the NHS to meet its waiting time targets and provide high-quality care. Anita Charlesworth, of the Health Foundation think-tank, said the mood in the NHS "could not be bleaker". "The level of deficits in terms of scale and how many hospitals are in deficit is unprecedented. It puts organisations under stress, which makes them fragile and risky. "There is pressure on recruitment, pressure on management and that has an impact on services. We are already seeing waiting time targets being breached." She also said capital budgets - money which has been set aside for building projects and maintenance - were being raided. When the three-quarter year figures were released, just seven of the 138 hospital trusts were in surplus. Last year NHS trusts finished over £800m in the red - with the health service as a whole balancing the books only after a cash injection from the Treasury and by raiding the capital budget. The rest of the UK does not release equivalent figures as hospitals are not run as autonomous organisations as they are in England. It means the accounts cover a wider range of services and therefore may take into account surpluses in other areas of the health service. Figures in Scotland have yet to be published. Meanwhile, ministers in Wales have predicted the NHS will break even. No data is available for Northern Ireland.